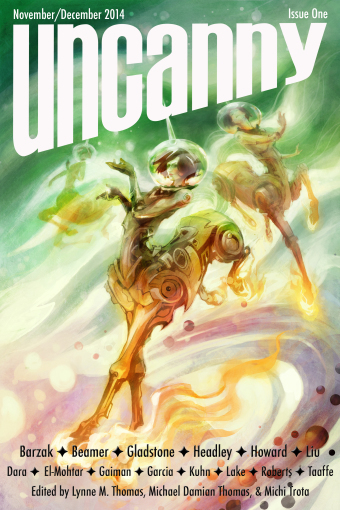 Welcome to the second installment of the Uncanny Magazine Podcast! This podcast was produced by Erika Ensign and Steven Schapansky. Music created by Null Device and used with their permission. You can subscribe at iTunes or with the RSS feed. Lynne and Michael are the Publishers/Editors-in-Chief for the three-time Hugo and two-time Parsec Award-winning Uncanny Magazine. Seven-time Hugo Award winner Lynne M. Thomas was the Editor-in-Chief of Apex Magazine (2011-2013). She co-edited the Hugo Award-winning Chicks Dig Time Lords (with Tara O’Shea) as well as Whedonistas (with Deborah Stanish) and Chicks Dig Comics (with Sigrid Ellis). Along with being a four-time Hugo Award-winner, Michael Damian Thomas was the former Managing Editor of Apex Magazine (2012-2013), co-edited the Hugo-nominated Queers Dig Time Lords (Mad Norwegian Press, 2013) with Sigrid Ellis, and co-edited Glitter & Mayhem (Apex Publications, 2013), with John Klima and Lynne M. Thomas.